You make tea. You sweeten your tea with sugar. 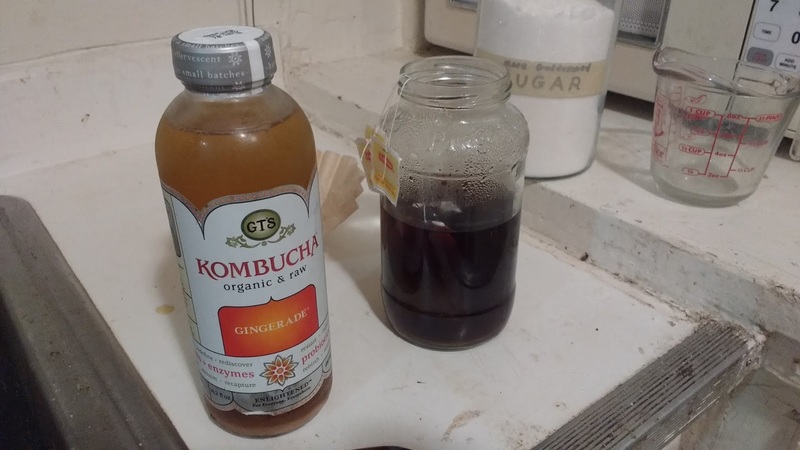 Then you add kambucha to it and let it sit for a week. This struck me as a crazy. You can make it by converting something as pedestrian as black tea into this weird expensive exotic drink? And you do so just by adding some of the finished product to the tea? That sounds like some black magic. That's like if someone told you you could make beer by mixing a big pot of weak coffee with a half a cup of beer. Wouldn't manufacturers, like, do something to their product so that it doesn't easily self-replicate? Place it on the shelf and then forget about it for a while. My guess was that it would work but that I'd discover the limitation as soon as I tasted this brew. 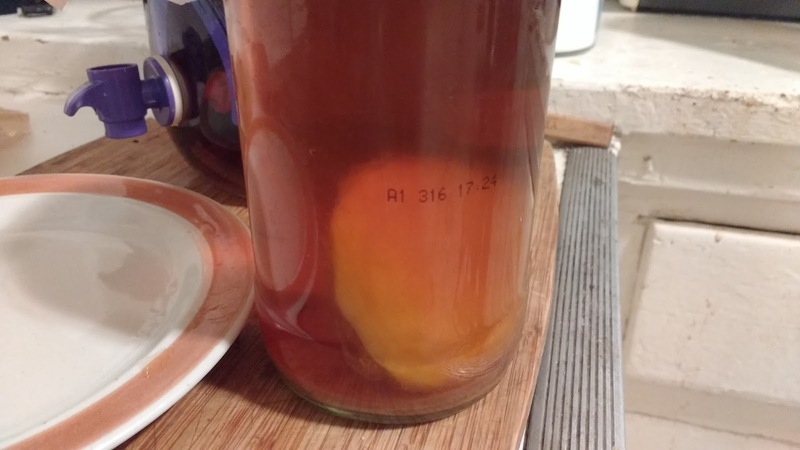 I expected particularly little from the first batch, because based on what I'd read, this is just intended to be a starter batch to generate the culture that ferments the tea. This culture is present in every bottle, but it just an invisible force that we know to be there. No. The culture forms a rubbery pancake that lives in your old tea. the first batch is intended to cause the yeast and symbiotic bacteria to aggregate at the surface of your tea and then generate what we call 'extra cellular matrix'. This means that microscopic things excrete materials that gel together to make an environment which gives them the right amount of air and moisture and sugar and nutrients. This pancake is called a Symbiotic Culture of Bacteria and Yeast, or SCOBY. 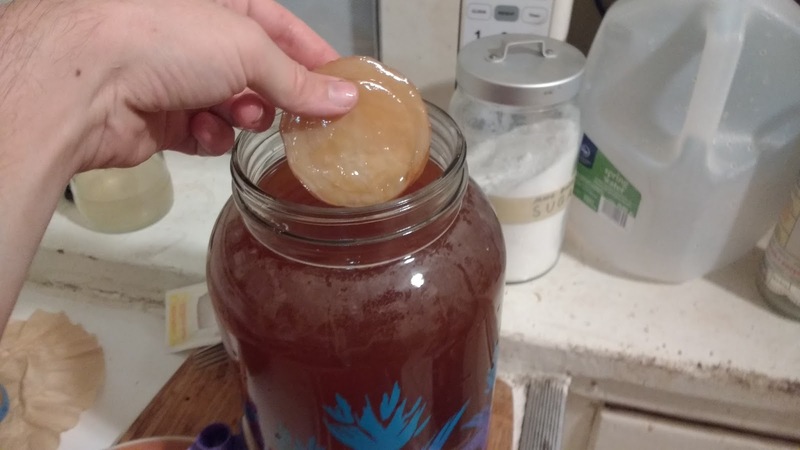 It's supposed to materialize out of nothing in your starter batch, then for each subsequent batch you pick the little SCOBY up and plop it in the fresh tea. 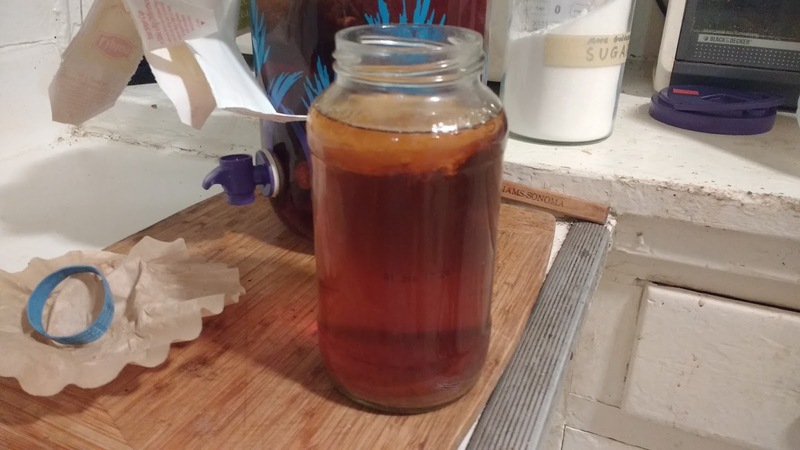 This tea provides the SCOBY with food, and as the SCOBY consumes the sugar and tea, it produces carbon dioxide to carbonate the drink, acid to give it it's tang, and who knows what else. Five days later, it had developed a thick head, and that head had then congealed into something you can hold with a fork. I set up the starter batch on August 8th. I pretty much ignored it until yesterday, which was twelve days later. Sitting at the top was a big rubbery pancake. 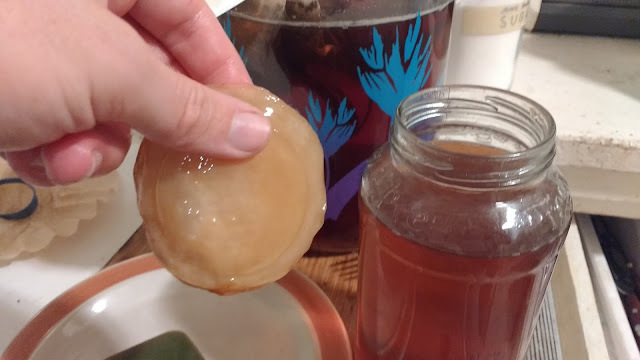 To the SCOBY's credit, I expected it to be way slimier and more gross looking. It was beige and very smooth. Right before I checked it, I swung by Goodwill to find a large jar. 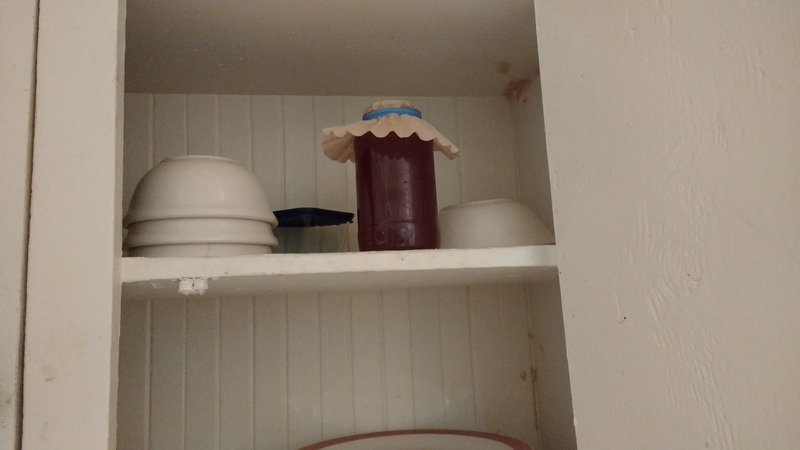 A spaghetti jar wasn't going to make more than one or two bottles. 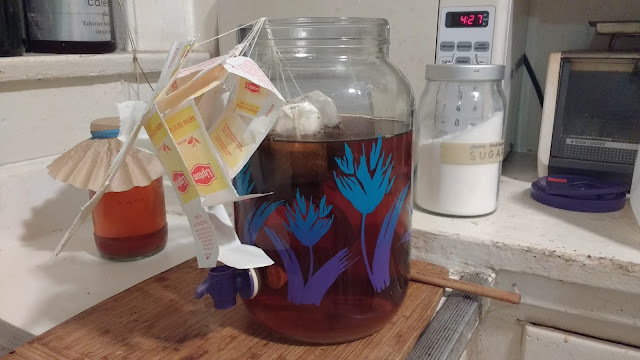 I found a gallon-sized jar for making sun tea, which seemed perfect. Step 1 of 2: Make sweet tea. Damn. That thing looks healthy. And freaky. When I tried to grab it, it sunk. I poured the tea, steeped it, and mixed in a cup of sugar for one gallon of tea. In college, Jack and I brewed and distilled vodka out of curiosity, and it was similar. 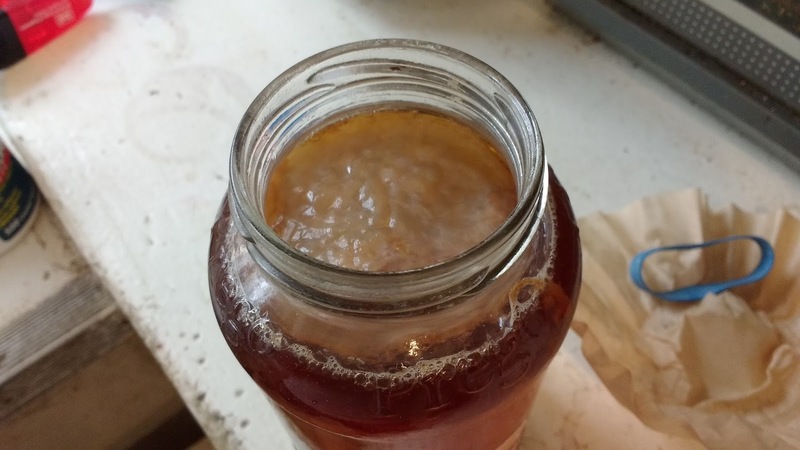 You mix yeast with sugar water and let it do its thing. This kind of process really impresses on you what is fundamental about living things. We need fuel, in this case sugar. We need water with which to fill our cells. We need carbon to build our cells out of, and in this case, that is also from the sugar. We need some nutrients and things, which the SCOBY apparently gets from old tea. It isn't as gross as I feared. It looks very clean. The underside is a little more lumpy. This is the oldest part of the SCOBY. It grows on it's top side. 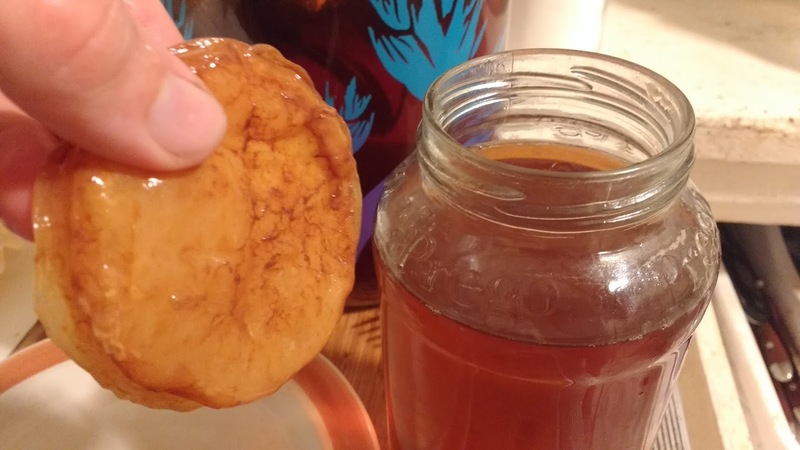 I pulled out the SCOBY and dropped it into the new tea. It sunk, which is apparently fine. Eventually, it will float its way up to the top, I'm told. I topped off my concoction with half of the product from the starter batch. 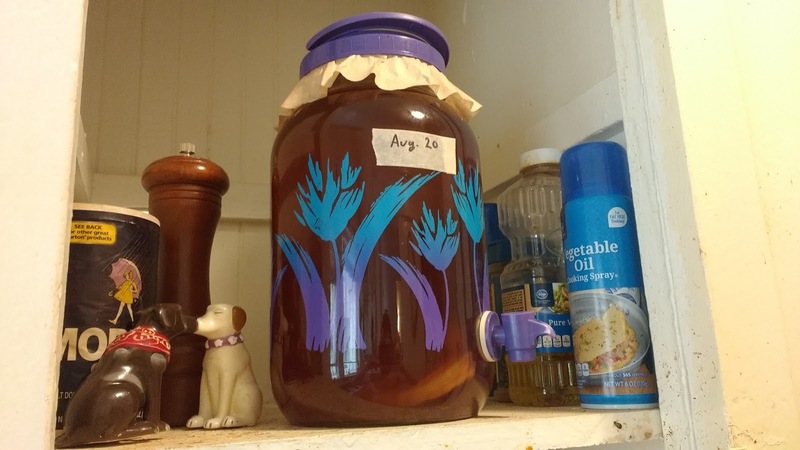 This is to make the tea acidic, so as to discourage growth from other bacteria or fungus which could swoop in and contaminate the brew before the SCOBY has asserted its dominance by proliferating. You can achieve the same result, supposedly, by adding a few tablespoons of vinegar. Step 2 of 2: Drop your slime monster in a fresh jar and let it go to work. And now we play the waiting game. 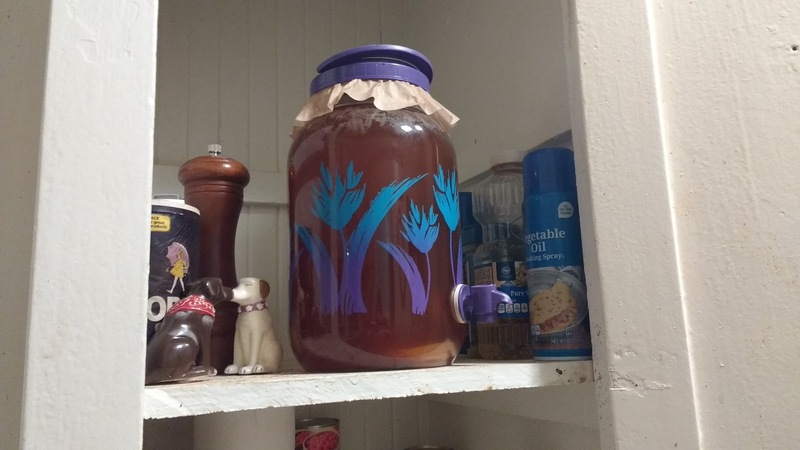 The SCOBY is visible next to the spigot. Left with the half jar of ten-day-old tea that provided a home to what looks like a baby tentacle monster, I sniffed it cautiously. Smelled yeasty and a bit sweet. Not unpleasant. I took a small sip. To my utter shock, it tasted great. It tasted like store bought. If it differed in any way, I would say that it was slightly stronger than store bought. Perhaps that was a buildup of acid, or of its trace alcohol product? I don't know, but apparently it's pretty hard to screw up. I'm hoping that this continues to go along smoothly. I could probably stop paying for seltzer water. Plus, now I've got a cool new pet that makes weirdo alien juice. The morning after I made it. The SCOBY looks like it's going to float upward.